This dates from June 2011 and was the first piece on Beware of the Trees, my old blog about life in Greenwich and south-east London generally. It was written by way of an introduction/explanation. I appreciate that the names in the last-but-one paragraph probably won’t mean much to anyone outside SE10, but… I’m sure you’ll get the drift. Just for the record, Nando’s, Zizzi and Byron are all now here, as is Frankie & Benny’s, but Soteri’s has now closed. Green Village, mysteriously, survives, its rows of empty table stretching out endlessly towards Deptford. The big hole on Woolwich Road (the ex-hospital) is now flats, and the park was closed for Olympic preparations. The big boat, of course, is the Cutty Sark, then being refurbished after catching fire. OK, I’ll level with you – I’m not from round here. True, my maternal grandfather came from Tooley Street, and worked in the warehouses on Hays Wharf, but my grandmother’s decision to marry someone from “Over The Water” was deeply frowned upon back in Bethnal Green. People Over The Water, so rumour had it, had vestigial tails, thick webbed toes, and thumbs that had evolved specially to fit into belt-hooks. They had no written language, but thirty-seven different words for lock-up. They had the pinched, angry faces of Millwall supporters, rather than the rosy dimpled cheeks and guileless smiles of Orient fans. 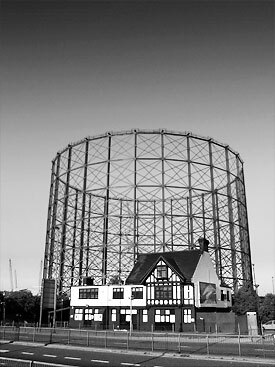 It was not even generally accepted that transpontine mating was actually possible, or certainly not that it was safe – was the unholy union of a Bethnal Green girl and a Bermondsey boy not likely to produce some sterile mule-like creature, useful only as a beast of burden or underworld goon? Luckily, my mother turned out to be neither. By the time I was born, though, my parents had begun the East Ender’s traditional slow crawl up the Central Line towards the Essex twilight, so I came of age in Leytonstone, not Bethnal Green, but – it was still the right side of the Thames, and we rarely crossed over. Oh, maybe there was the odd summer Saturday when we craved something more outré than Southend’s gaudy allure, and I have dim memories of the Crystal Palace dinosaurs and of once going to look for something in Biggin Hill (I forget what – possibly it was my father), but – mostly, we kept our feet firmly on terra eastenda. On those rare occasions on which we did take our lives in our hands, though, it was a proper adventure. Like Scott eyeing up his Antarctic prize, we would turn our gaze southwards, then point the Cortina at the Blackwall Tunnel’s baleful maw and, fists clenched and hearts pounding, wait to burst forth from the A102’s grim intestinal darkness into that strange, blitzed, petrochemical landscape, that rubbly waste of windowless metal sheds, broken glass and breakers’ yards skulking beneath the giant latticed drums of the South Metropolitan Gasworks. The gassy Kentish air, sour stinking and yeasty, seemed irredeemably toxic: years later, I discovered there was some sort of processing plant nearby, boiling up cheap feed for – or conceivably out of – unfussy household pets; back then, as we wound up the windows as tight as we could, it just smelt of South London. Yet now here I am, living less than two miles from the tunnel’s exit. Or “entrance”, as I’m having to learn to call it. It wasn’t a direct transition – I spent a few years in Bristol, and then a few more in a one-bed ex-council flat next door to a pub in Vauxhall. But Vauxhall isn’t South London: it’s Zone 1, for heaven’s sake, and there are bridges; you can wave at people on the opposite shore, get them to send help. Which means that, unless you’re looking for a one-bed ex-council flat next door to a pub, Vauxhall is as unaffordable as Hampstead; and, when the time came to move, it was down the Old Kent Road we looked, to Peckham, New Cross, and – yes – Lewisham. Not for one moment did we consider Greenwich; Greenwich, with its palaces and parks and globe-slicing-longitudinal-line-straddling, clearly wasn’t for the likes of us. That, though, was before we discovered what having South Eastern Trains going furtively about their murky business directly behind the kitchen wall at ten-minute off-peak intervals could do to house prices. So, yes, here we are. In Greenwich. And – blimey, it’s a rum bloody place, isn’t it? In fact, the whole of south-east London’s a rum bloody place. At the moment, I’ll admit, I’m still walking round full of wide-eyed wonder, my brain overflowing with questions. Why is there a great big hole behind those hoardings on Woolwich Road? Why are there no books in West Greenwich Library? Why do I have to go to Eltham for everything? Is Mevali’s “historic garden” the sort of thing Tony Robinson might be interested in, or is it more up David Starkey’s street? Which one is David Starkey’s street? Why can’t I go in the park? Why is everyone French? Why do the people in Ristorante Soteri and the Green Village Restaurant always look so sad? How excited, on a scale of one-to-meh, should I be that coming soon to Greenwich Promenade are a Zizzi, a Byron, AND a Nando’s. What is Greenwich Promenade? And, while we’re doing random questions – has anyone else seen that bloody great boat they’re building outside the foot tunnel??? How the hell did they ever get planning permission for THAT?!! Henry Moore's sculpture returns to Greenwich Park just after I've made lots of fuss about nothing to impress a French girl.